XQue is an application that can be described as "middleware". Middleware operates by simultaneously connecting to one or more analyzers and to the LIS. This is shown in the following diagram. The XQue client module is the master controlling module which contains all features required to configure and operate the application. The XQue client module launches co-operating modules such as interfaces and specialized lab operator modules. XQue includes "driver modules", also called "interfaces", for wide range of medical devices and systems. Interface modules provide the platform for implementing connectivity solutions of any complexity. In some cases, medical equipment may have an impairment or limitation that restricts usage. In such cases XQue may be able to offer expedient temporary or permanent workarounds. EDS continually adds interfaces as new equipment is released. XQue can be configured to "bank" analysers to converge the data from several analysers to a single channel. This can reduce the cost of connecting analysers separately to the LIS. 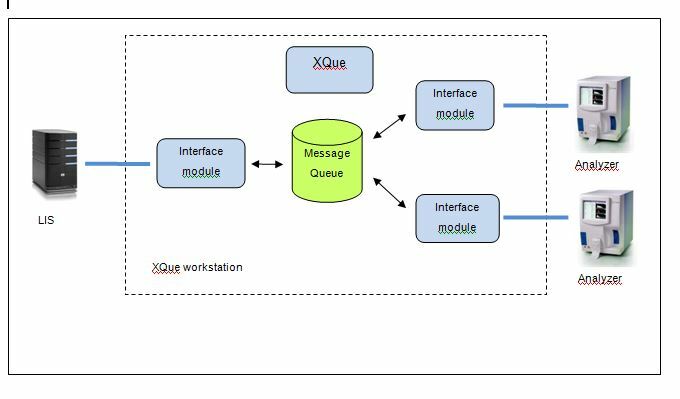 Without exception XQue interface modules use a message queue to control the data from the interface module. The message queue proviodes a secure, high performance and reliable platform to exchange messages with an analsyer, in both directions. The following diagram shows the data flow between the message queue and interface modules. All XQue drivers can be configured to simulate the actual medical device. This mode is called "emulation". In many cases this allows XQue to be connected to an existing LIS channel to allow a new analyser to replace an existing analyser of different brand/model. In this way XQue can be used to install a new analyser more efficiently than a direct connection to the LIS. If required custom validation rules such as delta can be implemented. When an auto validation rule fails and blocks a result, the operator may take action to release or re-run the result using the XQue client. QC results transmitted from analysers are captured, processed and stored. Westgard rules may optionally be applied. Failed QCs may optionally block following patient results from being transmitted to the LIS. XQue custom calculations are implemented with a spreadsheet and with minimal training lab staff can maintain such rules. XQue has features to enter orders and print clinical reports if required. In this way, XQue can operate as a basic LIS in which requests are entered and clinical reports validated and released. This mode of operation is always active, hence at any time Xque can operate as standby system covering periods when the LIS is not available. When used as a standby system results reported during the standby period may be transmitted to the LIS to allow recovery of the LIS. XQue captures all data transmission from analysers. This includes patient test reruns, QCs and calibrations. XQue is delivered with reports and displays that provide detail and summary for specimens and tests processed in a selected time period. All printed reports may optionally be copied to spreadsheet format.